As a remake of a 1989 SEGA Master System videogame, you may be expecting Wonder Boy: The Dragon’s Trap to be somewhat dated. 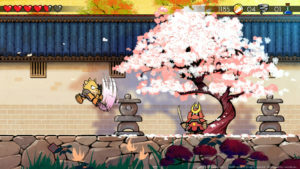 The truth is however, despite the limitations of the original hardware, Wonder Boy 3 could arguably stand-up to many modern ‘indie classics’ as a unique platform adventure. 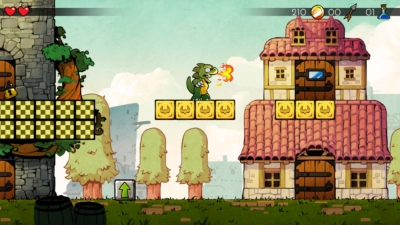 Thusly, Wonder Boy: The Dragon’s Trap is a more than welcome addition to the Nintendo Switch’s launch window software line-up. 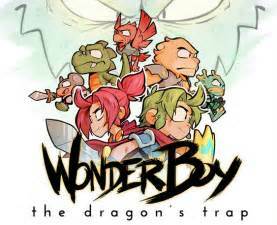 As stated above, Wonder Boy: The Dragon’s Trap is a platform videogame. However, this is no Super Mario or Sonic the Hedgehog; Wonder Boy: The Dragon’s Trap is more closely comparable to the 2D side-scrolling action elements featured in Nintendo Entertainment System (NES) classic The Legend of Zelda II: Adventures of Link. Some light role-playing game (RPG) elements and an intriguing death system make for a rewarding experience, if occasionally ill-balanced in difficulty. In typical 8-bit fashion, Wonder Boy: The Dragon’s Trap offers little in the way of hand-holding. An introduction level in which it’s impossible to fail teaches the player to jump and perform a basic attack, but once that’s completed you’re essentially on your own for the rest of the videogame. And it’s no slouch in duration either; even an experienced gamer will take several hours to complete Wonder Boy: The Dragon’s Trap on its ‘normal’ difficulty setting. Pathfinding is where Wonder Boy: The Dragon’s Trap offers its biggest hook while combat remains the greatest challenge, and the combination of the two leads to both enjoyment and frustration. Thankfully not in equal measure. Unlike traditional 2D platform videogames, the player is free to scroll both left-and-right, but it’s only with trial-and-error will they find the correct path to follow. Passing through doors will often see you taken backwards while falling down pits could be the correct path forward; head in the wrong direction and you may find an insurmountable challenge with your current equipment, forcing you to return later. 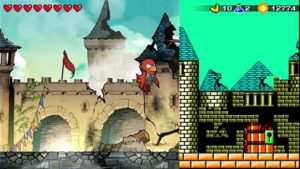 While Wonder Boy: The Dragon’s Trap only features a small selection of equipment, it offers variety by way of transformation. A small selection of creatures become available for the player to transform into throughout the adventure, beginning with a dragon. Each have their own unique abilities – some for combat, others for puzzle-solving – and must be used correctly in order to progress. Each transformation shares its life counter and players will soon develop a favourite. However, the option to switch between is lead by design opposed to preference, so getting the best from each is essential due to Wonder Boy: The Dragon’s Trap’s interesting death mechanic and unforgiving difficulty. Upon extinguishing your life supply the player will return to the village. However, while all disposable items will have been lost, progress will remain. Thus, the player must simply retread their steps and venture back to the point at which they had previously died, and beyond. It’s a mechanic that falls closely to the SEGA Dreamcast and Nintendo Wii’s Baroque; a cult role-playing game (RPG) that incorporated failure as in instrument for gameplay opposed to resulting in a punishment. From a visual standpoint, Wonder Boy: The Dragon’s Trap is a beautiful videogame. The cartoonish artwork is wonderfully colourful with immaculate detail, while the animation is fluid and charming. The option to flit between this new art style and the original 8-bit graphics with a simply press of the R button is a welcome design decision, and offers an instantaneous change. 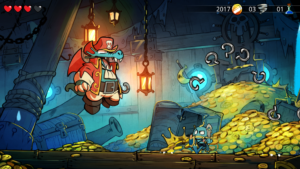 Wonder Boy: The Dragon’s Trap is a very enjoyable videogame that currently stands as unique in the Nintendo Switch’s software library. It’s challenging, of that there’s no doubt, but given that most of the software available for the console presently are either immediate, casual experiences or classic SNK titles, Wonder Boy: The Dragon’s Trap is a perfect accompaniment for those times between sessions of Mario Kart 8: Deluxe or The Legend of Zelda: Breath of the Wild.